Sister Agnes Marie Gunn, a resident at Saint Joseph Villa since 2011, died there on October 19, 2018. Her funeral followed on October 24. Born into a family of loving parents, Ernest and Agnes, Agnes and brother Ernie, resided in Glenside. After attending St. Luke School, Agnes attended St. Mary’s Academy, and Chestnut Hill College. Sister Agnes entered the Congregation of Sisters of Saint Joseph in 1949, and received the name Sister Agnes David. She described her vocation as something that really was not her decision, but a response to God’s quiet yet persistent call. Agnes’ life was filled with diverse, enriching experiences, moving in ministry from city, suburban, inner city, Jersey shore and the nation’s capital. In her joyful response to apostolic life, Agnes’ tender warmth and welcoming presence were blessings to all. As liaison for Sisters Education in the congregation, Agnes encouraged many sisters to stretch in their pursuit of advanced studies that would meet emerging needs. Agnes enjoyed her years as teacher at Hallahan and West Catholic High Schools, and Chestnut Hill College. During these years, she earned Master’s and Doctoral Degrees in English, both from the University of Pennsylvania. 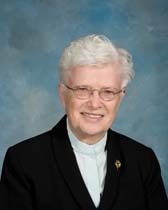 She served on the General Council of the Sisters of Saint Joseph, president of the United States Federation of the Sisters of Saint Joseph, Delegate for Religious in the Archdiocese of Washington, Director of Vocations in the Archdiocese of Philadelphia, and Pastoral Immigration counselor and Delegate for Religious in the Trenton diocese. A highlight of Agnes’ long ministry was the task she undertook of editing the SSJ Constitutions. This sacred duty of editing brought into play a large and talented committee that worked on diverse pieces of this revision. Sister Agnes was welcoming and respectful toward traumatized women refugees from Liberia. Rooted deeply in her vocation, she was nourished by daily prayer and Eucharitst, raidiating God’s love to all. Bishops and Religious with whom she worked throughout her ministry were recipients of her goodness and wisdom. I had the privilege of being a student of Sr. Agnes at both Hallahan High and at Chestnut Hill College. She was always there for me through the years as a friend and a mentor. I will miss her. As a Sister of Saint Joseph, the happiest, and most spiritually enriched year of my life was spent at Saint Rose, Belmar while Sister Agnes was superior. She was the most humble, spiritual and pleasant sister I ever lived with. I am sorry I missed her death. I surely would have been among the sisters celebrating her life. The SSJ’s have lost a beautiful soul in Sister Agnes David Gunn. Rest in Peace Sister.